These numbers do not even touch on unexpected expenses such as injuries or illness or ongoing conditions such as skin conditions or diabetes. With your donation, we are able to expand our care and rescue more animals from kill-shelters. 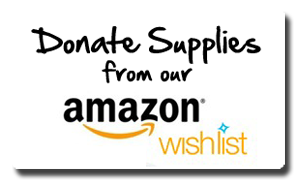 Or, you can visit our Amazon wish list here and pick out something special for us! Fostering an animal is one of the most rewarding experiences ever, as many of our fosters will attest. For more information on fostering and to apply to be a foster, please see our foster page here. For volunteering opportunities and ideas, please see our volunteer page here.